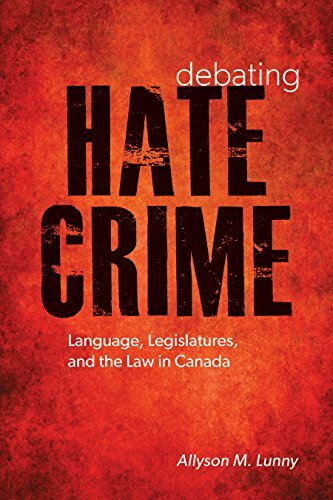 Debating Hate Crimes examines the language used by parliamentarians, senators, and committee witnesses to debate Canada's hate laws. Drawing on discourse analysis, semiotics, and critical psychoanalysis, Allyson M. Lunny explores how the tropes, metaphors, and other linguistic signifiers used in these debates expose the particular concerns, trepidations, and anxieties of Canadian lawmakers and the expert witnesses called before their committees. In so doing, Lunny reveals and interrogates the meaning and social signification of the endorsement of, and resistance to, hate law. The result is a rich historical and analytical account of some of Canada's most passionate public debates on victimization, rightful citizenship, social threat, and moral erosion. If you have any questions about this product by UBC Press, contact us by completing and submitting the form below. If you are looking for a specif part number, please include it with your message.